Seafood Gumbo..just add Voodoo Sauce! Strolling through the French Market you will come across a well organized store selling yet, what you think of, more spices and hot sauce. Not true. Arthur Humphery and Tambourine Green are not "just" selling, they manufacture their own line and Arthur's family has been doing it for over 75 years. Arthur's own Voodoo Sauce, so I had to check it out. A group of fellow foodies from South Florida sat next to me and we re-enacted the scene from TV. it. Hell and Voodoo Sauce is just that, in a good way! of gumbo, I started with the hic-ups. The bit of heat got increasingly more intense but was good and bread was consumed to kill off the heat, then more bread and then a couple of more pieces! burn. You must have a a dairy product to quell the heat in your stomach. A packet of sugar also works, just don't eat the packet it! American...what the hell, I'm on vacation not on a diet!!! Several years ago on a flight from New Orleans to New York City, I sat next to a guy who was on his way to check up on new restaurant in New York and he told me about some sort of alligator cheesecake he serves. What did I know? Who was this guy that knew Chef Paul and Emeril? a Hawaiian shirt, flip-flops and walking around with a drink in hand. after walking there to check the place out. the place was packed and a line out the door! Something here must be right. 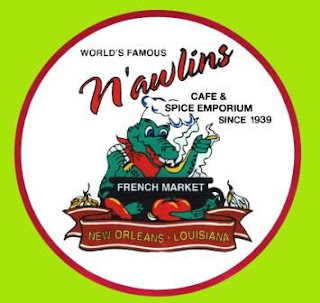 The menu here is a fantastic mix Creole and Cajun; loaded with everything from high quality fish,shrimp, oysters and even fried chicken. began the meal along with delicious corn muffins drizzled in garlic sauce, a great tasting duo. striped awning on Washington Avenue, and I got to wear shorts!! Here's Jaques website Click on pictures to enlarge. Artz Bagelz on Magazine St. In the French Quarter, if you want a traditional Creole breakfast, visit the Old Coffee Pot on St. Peter Street for callas cakes and grits. fried rice pudding. Not really rice pudding either, it's balls of rice, held together by something, battered and fried. It comes with powdered sugar. Just pour syrup on it and eat it! It's good, although your cardiologist may think otherwise. I finally made it back to New Orleans since Hurricane Katrina, yes things take time, and that time has allowed many new restaurants to take shape. Not such a new restaurant is Commander's Palace, a fine dining institution that should be on everyone's list. I have dined there in the past to stellar service; there seems to be a waiter for everything from buttering your bread to wiping your face after eating. They do everything here except eat your dinner and follow you into the bathroom! Tonight's fare pictured here include filet mignon over mashed potatoes, a cut of beef garnished with crawfish tails served over rough-cut grits and creole cream cheese cake for dessert. because the hostess felt sorry for them? Let's hope not. On top of all this and an otherwise beautifully presented meal, we sent everything back except the cheesecake,and received a heartfelt apology from our waiters and the Captain. A disappointing evening. I guess not everyone can be 100% all of the time. Destination: Junction Boulevard and Roosevelt Avenue stop on the "7 train"
to seek out another place from Diners, Drive Ins and Dives; the now world famous Rincon Criollo Cuban Restaurant! sweets and anything imaginable from Ecuador, Mexico and beyond. Each block is a different country ranging from food carts to food trucks selling everything from pork to pozelle..and the train was a mere $2.25, so much less than a flight. Rincon Criollo. Greeted by 3rd generation owner Rudy, we were welcomed into his house as if we were old friends. A drink order was placed for cerveza. Although Cuban beer is not permitted here, a non-embargoed Estrella Damm from Spain was brought to the table ahead of the order of homemade goodness. because it sounds better than YUCK-a, from what Rudy told me,and ropa vieja with bell peppers. This tastes really homemade. Accompanied by the must-have Cuban black beans and rice, as well as a red beans with meat serving, both delicious, followed by what was probably the best flan EVER and an espresso. As Rudy said, "We're not a diner, drive in or a dive, we're a restaurant!" A winner, for a change, from Triple D. Go here.